Not Always Just Like Home! Now here's a part of travel you might not stop to think about. Truthfully, if you're traveling domestically in the US, you probably don't need to worry too much about toilets. But if you're traveling internationally, you're probably going to run into a surprise or two. Talk to people who have been traveling internationally for a while, and they're bound to have one or two amusing toilet stories. If you're going to big cities almost anywhere in the world, most of the time you will find toilets that are pretty much like the standard pedestal style you’re used to…. And what should you ask for when you.... ah... need to go? It's just better to say you need the toilet or the WC (for water closet). If you say you need to find a bathroom, they'll think you want a bath or shower! 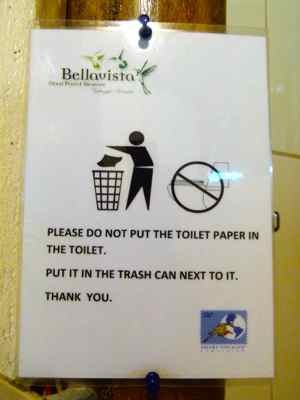 WC is understood almost everywhere in the world. On the Trans-Siberian Train, even though we couldn’t understand the Russian we knew we had found the WC. (I think this sign also is telling you not to hog the WC because others could be waiting… but that’s just my interpretation. Is this something that you've been dreading? If you want to travel, just get over it. 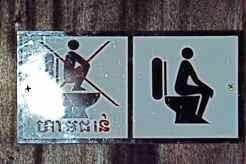 In many areas of the world the, the squat toilet is the preferred style. If you get out into the countryside in many areas of the world, it's just possible that you'll run into some that are more porcelain footprints with a hole. Sometimes you'll find one of each style... sometimes you won't have a choice. The truth is that you can run into both “Western style" and "Eastern Style" anywhere in the world. You won't always have that "throne" so just make up your mind that you can deal with foreign toilets. You’ll even find that where there IS a "Western Style" sit down toilet, sometimes the locals aren't used to them…. Then THEY will need an explanation on how to use it. We found one in Cambodia near Angkor Wat with an explanation for locals that we just had to take a picture of. It always pays to have some toilet paper in your pocket. Even if you find a toilet that has a TP dispenser, it could be empty. It’s better to have toilet paper and not other tissues, because TP is made to disintegrate more easily in toilets…. I always roll up a few squares and have enough for a couple of “stops”. Even when we’re on road trips at home that can come in handy. In more rural areas and more undeveloped counties, even toilet paper might clog up the plumbing. In places like that you'll see wastebaskets with dirty paper... put yours there too. It’s not gross, it’s just a fact of life. 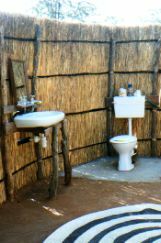 You might even find a "western style" toilet in remote areas, like these in tented camps in Africa. It's a luxury to have that throne, but the plumbing is fragile, so don't plug it up. 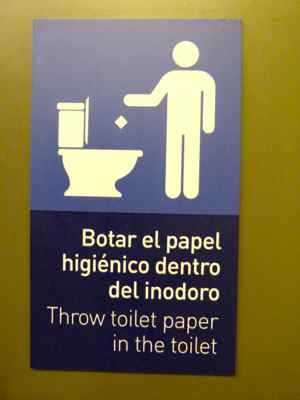 Finding a public toilet can be harder abroad than it is in the US. If you're out wandering the street, look for train stations or department stores. If there is a US style fast-food restaurant, you can find a toilet inside. Big hotels will have a WC tucked away in the lobby somewhere, and they are reliable for having TP. Never leave a museum without going - even if you don't need to. Who knows when you'll find the next one? Many big European cities have coin operated "toilet booths" on street corners. Public toilets often are pay toilets. Carry small change to pay for them. Some will be coin operated on the door, others will have attendants sitting in the door. Even if the attendants don't insist on you paying when you go in, it's polite to leave a small tip... it's usually only the equivalent of about 25 US cents. Don't expect them to have change... they might, or they might just keep the change if you don't have anything small enough. It's another way for them to make a little money. So plan ahead -- don't give away all of your "little money". It'll come in handy. But Wait... Who's In There? Get used to occasionally having women cleaners in the Men's rooms and sometimes men attendants in the Women's room. Lots of toilet stories come from these encounters. In areas where this happens, the locals are used to it, so you might as well just get comfortable with it too. The further out into the world you get, the more you'll run into those "Eastern Style" porcelain holes-in-the-ground. 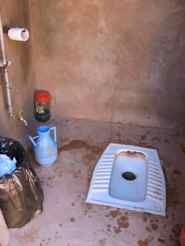 Like the foreign toilet we had at our Bedouin Camp in Wadi Rum Jordan. They may not be as clean as you’d like… that bush might start looking pretty good! One time when we were in India, we stopped for gas and our driver used the toilet at the gas station. I asked if I could and he said “No, it’s not clean. I’ll find a place for you soon.” And yes, it was a very nice bush. Some foreign toilets will even be just that -- holes in the ground. Or something like the arrangement we found when we were at the Potala in Tibet and asked to use the WC.... The ladies room was over a deep pit with two big parallel logs that we all could balance on and use... communally! Sure wouldn't want to lose your balance there!!! At least the men's room was separate! I remember one friend who encountered the old hole-in-the-ground type when we were in Africa. She opened the door then looked at us and said, "Which way do I aim?" At least she was a good sport about it! OK, OK... if you've gotta go, you've gotta go. 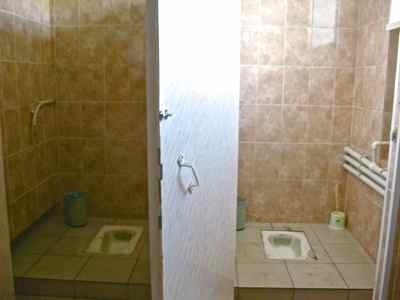 Just know you're going to run into SOME foreign toilets that are way different than you're used to.... deal with it, and you'll come home with some toilet stories of your own. And if you have a good one, why don't you share it with a comment below or over at your travel stories... We'd love to hear it!